The 35cm 14" Silk Knife Pleat Empire Shade is in Almond. The 40cm 16" Silk Knife Pleat Empire Shade is in Almond. The Oaks Beaded 14" Pleated Lamp Shade is in Coffee. The Oaks Beaded 14" Pleated Lamp Shade is in Ivory. The Oaks 14" Cotton Coolie Lamp Shade is in Beige. The Oaks 16" Cotton Coolie Lamp Shade is in Beige. The Oaks 16" Cotton Drum Lamp Shade is in Beige. The Oaks 14" Slim Rectangular Lamp Shade is in Black. The Oaks 16" Cotton Coolie Lamp Shade is in Black. The Oaks 16" Cotton Drum Lamp Shade is in Black. The Oaks 14" Cotton Coolie Lamp Shade is in Blue. The Oaks 16" Cotton Coolie Lamp Shade is in Blue. The Oaks 16" Cotton Drum Lamp Shade is in Blue. The Oaks 16" Cotton Coolie Lamp Shade is in Chocolate. The Oaks 16" Cotton Drum Lamp Shade is in Chocolate. The Oaks 14" Empire Faux Silk Lamp Shade is in Cream. The Oaks 14" Oval Faux Silk Lamp Shade is in Cream. The Oaks 14" Slim Rectangular Lamp Shade is in Cream. The Oaks 14" Tapered Square Faux Silk Lamp Shade is in Cream. The Oaks 16" Cotton Coolie Lamp Shade is in Cream. The Oaks 16" Cotton Drum Lamp Shade is in Cream. The Oaks 16" Empire Faux Silk Lamp Shade is in Cream. The Oaks 14" Box Pleat Lamp Shade is in Duck Egg. The Oaks 14" Empire Faux Silk Lamp Shade is in Duck Egg. The Oaks 14" Slim Rectangular Lamp Shade is in Duck Egg. The Oaks 14" Scalloped Lamp Shade is in Duck Egg. The Oaks 14" Traditional Shaped Square Lamp Shade is in Duck Egg. Duck Egg 16" Box Pleat Faux Silk Lamp Shade - Oaks Lighting. The Oaks 16" Box Pleat Lamp Shade is in Duck Egg. The Oaks 16" Cotton Coolie Lamp Shade is in Duck Egg. The Oaks 16" Scalloped Lamp Shade is in Duck Egg. The Oaks 16" Traditional Shaped Square Lamp Shade is in Duck Egg. The Oaks 14" Cotton Coolie Lamp Shade is in Forest. The Oaks 16" Cotton Coolie Lamp Shade is in Forest. The Oaks 16" Cotton Drum Lamp Shade is in Forest. The Oaks 14" Traditional Shaped Square Lamp Shade is in Gold. The Oaks 14" Tapered Square Faux Silk Lamp Shade is in Gold. The Oaks 16" Traditional Shaped Square Lamp Shade is in Gold. The Oaks 14" Box Pleat Faux Silk Lamp Shade is in Grape. The Oaks 14" Empire Faux Silk Lamp Shade is in Grape. The Oaks 16" Box Pleat Faux Silk Lamp Shade is in Grape. The Oaks 14" Cotton Coolie Lamp Shade is in Green. The Oaks 16" Cotton Coolie Lamp Shade is in Green. The Oaks 16" Cotton Drum Lamp Shade is in Green. The Oaks 14" Cotton Coolie Lamp Shade is in Hot Pink. The Oaks 16" Cotton Coolie Lamp Shade is in Hot Pink. The Oaks 16" Cotton Drum Lamp Shade is in Hot Pink. The Oaks 14" Box Pleat Faux Silk Lamp Shade is in Ivory. The Oaks 14" Scalloped Faux Silk Lamp Shade is in Ivory. The Oaks 14" Traditional Shaped Square Lamp Shade is in Ivory. 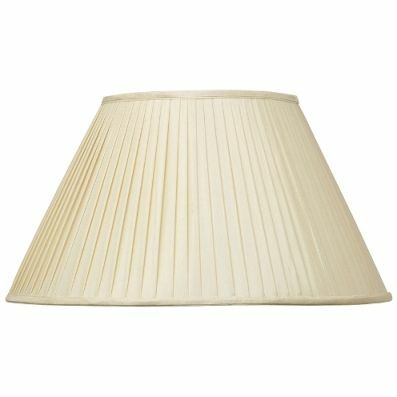 The Oaks 16" Box Pleat Faux Silk Lamp Shade is in Ivory. The Oaks 16" Pinched Pleat Faux Silk Lamp Shade is in Ivory. The Oaks 16" Scalloped Faux Silk Lamp Shade is in Ivory. The Oaks 16" Traditional Shaped Square Lamp Shade is in Ivory. The Oaks 16" Cotton Coolie Lamp Shade is in Light Blue. The Oaks 16" Cotton Drum Lamp Shade is in Light Blue. The Oaks 14" Cotton Coolie Lamp Shade is in Lilac. The Oaks 16" Cotton Coolie Lamp Shade is in Lilac. The Oaks 16" Cotton Drum Lamp Shade is in Lilac. The Oaks 14" Cotton Coolie Lamp Shade is in Mushroom. The Oaks 14" Cotton Drum Lamp Shade is in Mushroom. The Oaks 16" Cotton Coolie Lamp Shade is in Mushroom. The Oaks 16" Cotton Drum Lamp Shade is in Mushroom. The Oaks 14" Cotton Coolie Lamp Shade is in Mustard. The Oaks 14" Cotton Drum Lamp Shade is in Mustard. The Oaks 16" Cotton Coolie Lamp Shade is in Mustard. The Oaks 16" Cotton Drum Lamp Shade is in Mustard. The Oaks 14" Cotton Coolie Lamp Shade is in Navy. The Oaks 14" Cotton Drum Lamp Shade is in Navy. The Oaks 16" Cotton Coolie Lamp Shade is in Navy. The Oaks 16" Cotton Drum Lamp Shade is in Navy. The Oaks 14" Cotton Coolie Lamp Shade is in Olive. The Oaks 14" Cotton Drum Lamp Shade is in Olive. The Oaks 16" Cotton Coolie Lamp Shade is in Olive. The Oaks 16" Cotton Drum Lamp Shade is in Olive. The Oaks 8" Cotton Drum Lamp Shade is in Olive. The Oaks 13" Oval to Square Faux Silk Lamp Shade is in Ivory. The Oaks 15" Oval to Square Faux Silk Lamp Shade is in Ivory. The Oaks 17" Oval to Square Faux Silk Lamp Shade is in Ivory. Luxury Lighting supply a vast range of 14" to 16" lamp shades at low affordable prices. These lamp shades are ideal for use on table lamps, small floor lamps and ceiling pendants. The 14" to 16 " lampshades are available in a wide variety of styles and colours. View the full collection of 14", 15" and 16" lamp shades online today.